Phew! I'm back from a week away on vacation, my daughter has now officially started the 1st Grade, and I am finally finding a bit more time at the sewing machine! In fact, yesterday I managed to finished quilting and binding my latest quilt, Patchwork on Point. 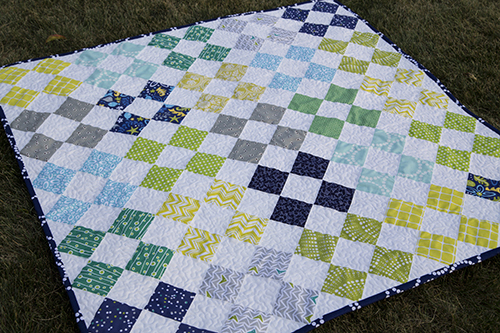 This quilt features a variety of fabrics from Heather Dutton for Modern Yardage. You can read more about these particular fabrics in this blog post. I paired Heather's fabrics with a few coordinating prints from my stash. I really love the colors in this quilt. I think it would be good for a girl or a boy. The design is simple, squares on point, but I created a bit of interest by grouping prints in sets of four. 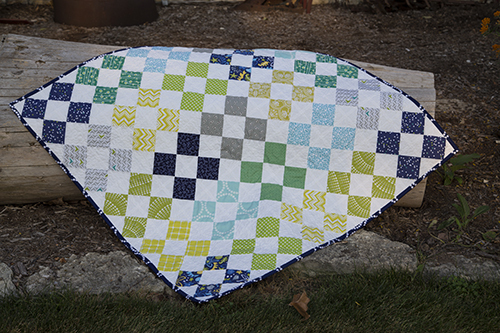 I wanted this quilt to have a fluffy look and texture, so I only quilted the negative space in a free motion meandering design. The quilt measures 45" x 45". Some of you may be wondering how this one washed up, since the Modern Yardage fabric has the design printed on it. I didn't use any special detergents, just my Kirkland Free and Clear liquid from Costco (because I think the final recipient will be washing it in whatever they have at home). I would say it reacted as expected. A bit of fading on the darker colors. I don't think it takes away from the quilt in any way, but just something to keep in mind as you select your fabrics for your project. You can read more about the suggested washing/drying for the fabric here.